The NFL is about to bypass television for the first time and bring a game to fans via the Internet. Sunday's Bills-Jaguars game in London will be delivered live all around the world by Yahoo in a high-stakes test of web streaming. "Our tagline is Watch With the World, which we really think captures what this experience is," said Hans Schroeder, the NFL senior vice president in charge of media strategy. Most NFL games are accessible on the Internet to paying subscribers, but only as a supplement to the free TV broadcast. This one is different because it's free online. The only two TV stations that will broadcast it are in the Bills' and Jaguars' hometowns of Buffalo and Jacksonville. In the future, this could become much more common. While CBS, Fox and other broadcasters own the rights to most games through the early 2020s, there is a slate of Thursday games that might be available next fall -- if CBS doesn't hold onto the rights. CBS will surely try, but others like Yahoo will probably try to steal or share the Thursday package. "There's a lot of interest across the marketplace," Schroeder said. It all starts with Sunday's game on Yahoo. Kickoff time is 9:30 am Eastern, which is well-timed for afternoon audiences in Europe and prime time audiences in Asia. "They're going to put the game on Yahoo's homepage," Schroeder said, "which touches tens of millions of people every day around the world. They're going to put it in their Yahoo Mail, where you'll come in to check your mail on Sunday and in the upper right corner, there'll be a live stream of the game." Game content will be featured on Tumblr as well. Yahoo reportedly spent about $20 million for the rights to the game. 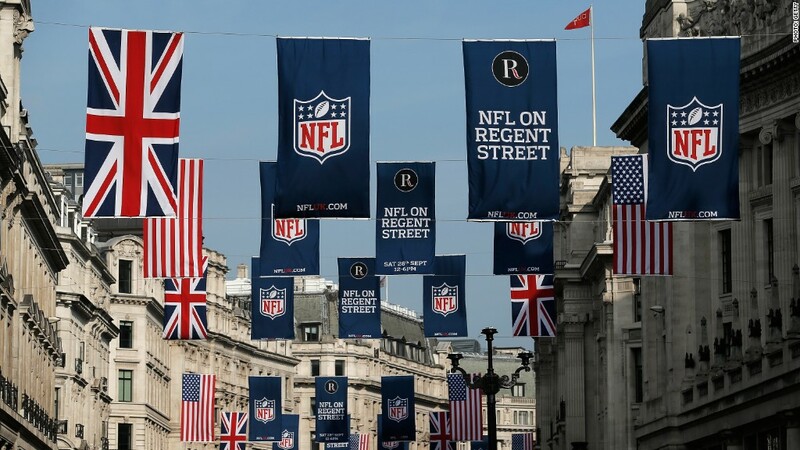 The NFL usually sells television rights to a mishmash of partners outside the United States. The number of ads during the game will be a little lower than NFL fans are used to. "We probably took seven to eight minutes out of the game, which will allow us one less break per quarter. The game will flow a little faster," Schroeder said. And the advertisers will be able to take advantage of retargeting technologies that don't exist during television broadcasts. "You can, as an advertiser, extend your message beyond the three-hour game window — to one, two, three weeks down the road, and reach that same fan," he said. Yahoo announced on Thursday that it had sold out the inventory for the game. There will be two feeds with different ads, one for the U.S. and one for other countries. Will viewers mainly watch on their smart phones, or will they gravitate toward tablets, laptops and big-screen TVs for the live stream? Will they appreciate this new way of viewing or will they complain that the game is not listed on their cable channel lineups? "I think the learnings we get out of this experience will really shape some of those decisions we make going forward about who we partner with on game distribution, both in the near term, but then in the long term as well," Schroeder said. The NFL and Yahoo will also be able to measure how many people watch in granular detail, another big difference from television.